Designed specifically for use with IEPE sensors. 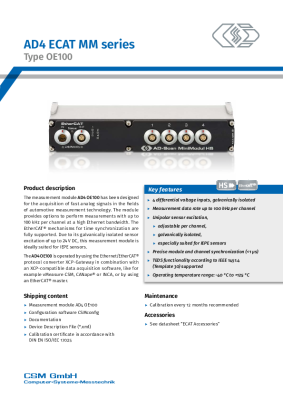 With up to 100 kHz per channel, the high-speed EtherCAT® measurement modules simplify your application. 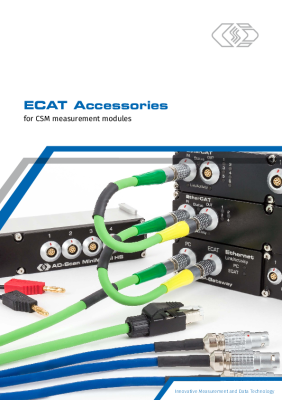 The high-speed ECAT measurement modules for IEPE sensors enable the acquisition of analog voltages with data rates of up to 100 kHz. The AD4 IE100 features a galvanically isolated sensor excitation up to 24 V and a measurement range from ±1 V to ±20 V. This makes that module ideally suited for measurement tasks making use of high-frequency IEPE acceleration sensors and microphones. AD4 OE100 is provided with a measurement range from ±5 V to ±90 V and an isolated sensor supply with up to 24 V supply voltage. The modules are operated via the Ethernet/EtherCAT® protocol converter XCP-Gateway in conjunction with XCP-enabled data acquisition software. 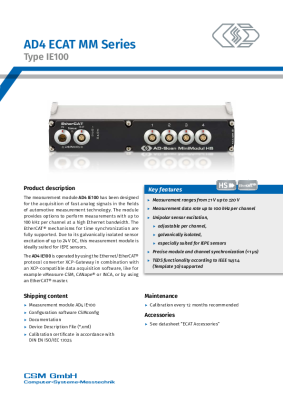 Measurement data rates > 10 kHz per channel are supported by vMeasure, CANape and in INCA via the add-on CSM INCA AddOn ETH. Alternatively, the modules can be operated by using a standard EtherCAT® master via CANopen over EtherCAT® (CoE) with measurement data rates up to 10 kHz. Designed for the acquisition of fast analog signals in distributed measurements applied in the fields of automotive measurement technology. High-precision bipolar sensor excitation allows the use of a wide range of standard sensors. The number of electrical and electronic components in vehicles is steadily rising. In order to provide an efficient design of vehicle electronics and electrical systems, precise measurements of current and voltage are essential.